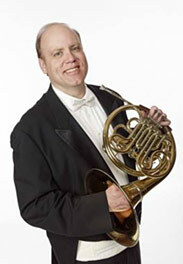 Daniel Sweeley was appointed 2nd Horn of the Buffalo Philharmonic Orchestra in 2000. He served in that capacity until moving to 4th Horn in 2015. A native of Lansing, Michigan, he served five years as 2nd Horn in the Dayton Philharmonic Orchestra prior to his appointment in Buffalo. He holds degrees in Horn Performance and Music Education from The University of Michigan and a Masters degree in Horn Performance from the University of Cincinnati, College-Conservatory of Music. His primary teachers have included Louis Stout, Lowell Greer, Roland Pandolfi, Marie Speziale, Michael Hatfield and Randy Gardner. He has performed with the Cincinnati, Louisville, Jacksonville, Syracuse and Chautauqua Symphony Orchestras. Sweeley was a featured guest artist at the 2001 Northeastern Horn Workshop in Hartford, CT. He was a prize-winner in the 1994 American Horn Competition University Division. He has held teaching positions at the University of Dayton, SUNY Fredonia and Buffalo State College and has given Master Classes around the US. He has served as the BPO’s ICSOM delegate since 2011, in addition to serving on the AFM Local #92 Executive Board for the same period of time. His interests outside of music include Detroit Tigers baseball, Michigan football and working on or showing his 1972 Oldsmobile Cutlass. He resides in West Seneca, NY with his cat Chester.